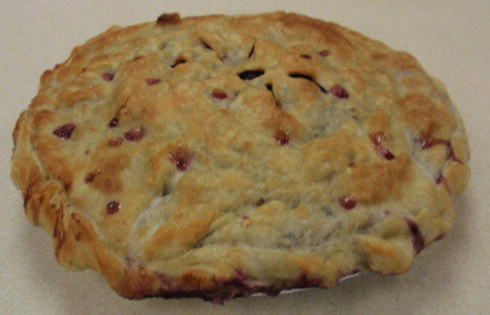 Love blueberry pie? 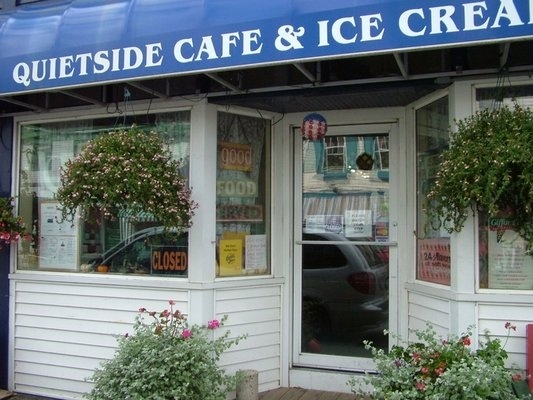 Find pie nirvana at the Quietside Cafe in Southwest Harbor, Maine. 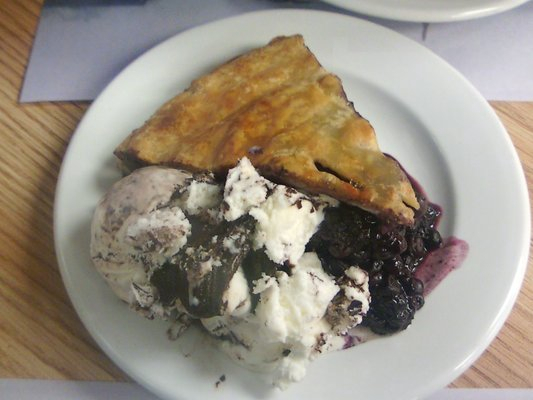 Blueberry pie in Maine stands tall, like this piece from the Quietside Cafe in Southwest Harbor. Like many people, I went to coastal Maine to eat lobster and didn’t know until I got there that I’d also entered blueberry-pie-lovers’ heaven. And like a hungry bear that wanders into town, I gorged on both delicacies during a blissful summer visit several years ago. The memory still lingers. My personal benchmark for terrific lobster and transcendent blueberry pie remains Mount Desert Island, home of the rugged Acadia National Park, the famous port town of Bar Harbor, and the lesser-known fishing village of Southwest Harbor, where I believe I achieved pie nirvana. 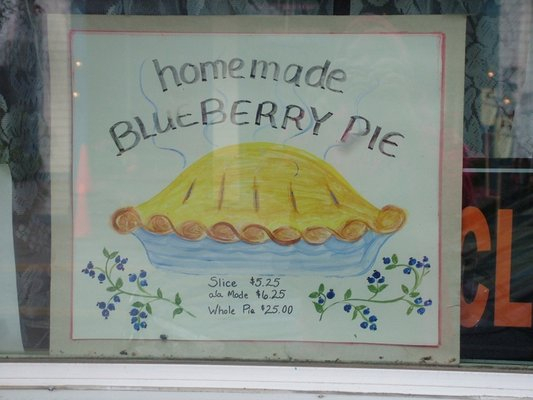 The art of pie-making extends to sign-making at the Quietside Cafe. More recently (this summer) my friend Teresa vacationed in Maine with her husband and son and confirmed that it remains a sort of Paradise, Elysian Fields, Valhalla, Shangri-La, Avalon, and Kingdom Come of pie. A loyal follower of the Bakery Boy Blog, Teresa returned home to Alabama raving about those pies. Though small, the Quietside Cafe can pack in a huge pie-loving crowd. 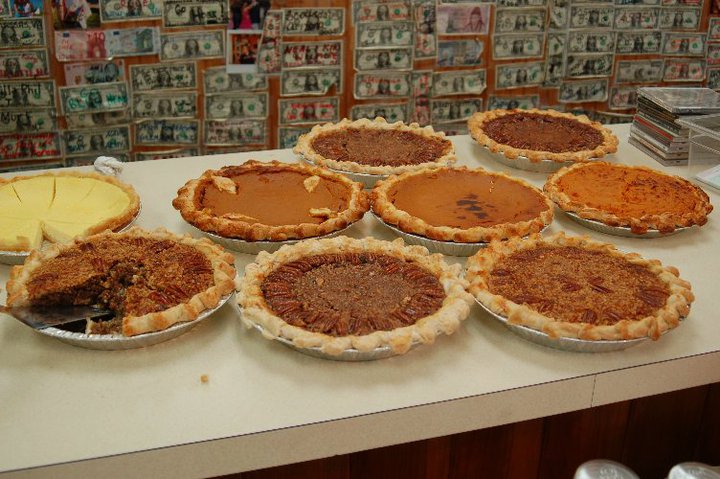 Now I know two things: One, Maine still holds a deservedly pie-and-mighty place in the universe of pie. Two, I should get back there as soon as possible. Make that three: I have a fresh excuse to call Downeast Maine pie makers and chat. Piemaker Frances Reed and her daughter Marlena. FRANCES REED, PIE QUEEN After just three rings I got an answer and asked, May I speak to whoever makes those great blueberry pies at the Quietside Café please? It’s a pleasure to meet you Frances. What is it about your pies that makes people rave about them? And the impressive height of your pies, how do you achieve that? 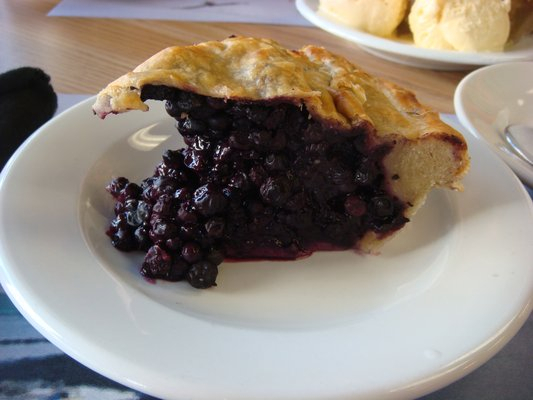 A whole blueberry pie at Quietside Cafe goes for $27. A good crust is key to any successful pie. What’s your secret? Blueberry Pie a la Mode. But the price is no secret, right? What other pies to you make? In fall, Quietside Cafe pies include pumpkin, sweet potato, and chocolate espresso pecan. You don’t sound like you’re from Maine. 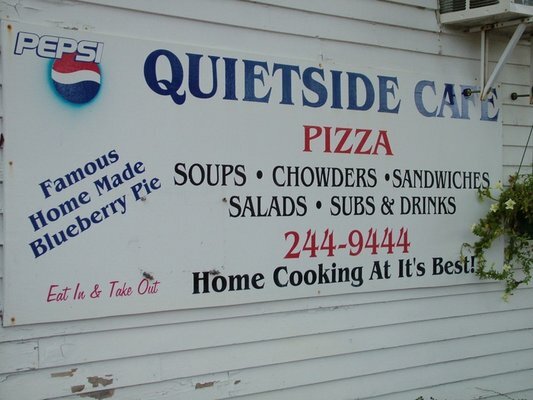 What else does the Quietside serve? 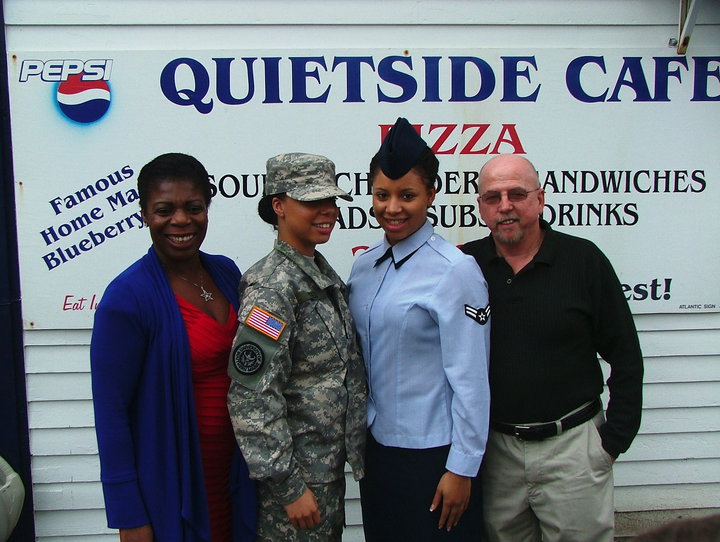 Frances, Marlena, Ebony, and Ralph Reed at their Quietside Cafe. What do they want most when they come home? 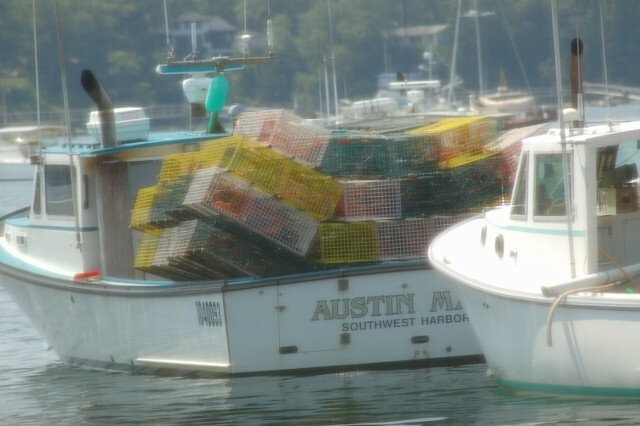 Lobster boats dot the Maine coast. 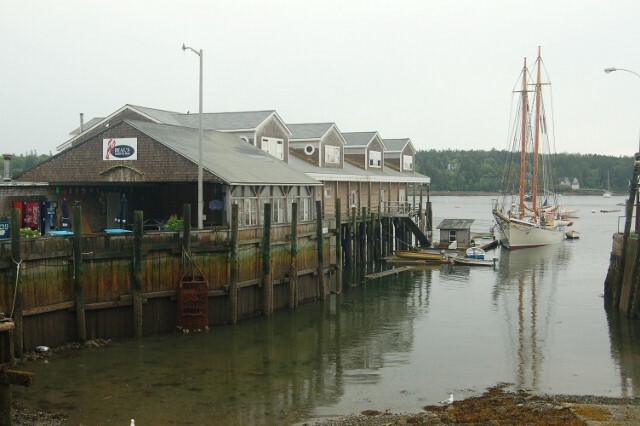 Beal's Lobster Pier in Southwest Harbor. HONORABLE MENTION According to my pie-questing pal Teresa, the blueberry pie at The Captains Galley at Beal’s Lobster Pier, three-quarters of a mile from Quietside Café, is also among the best on pie-intensive Mount Desert Island, which we’ve taken to calling Mount Dessert Island for good reason. I missed reaching the owners because they’d already closed and headed south for the winter. My suggestion: Try pie at both places—and any others you find in the area—then decide for yourself. SHARE YOUR FAVORITE PIE? If you’ve found nirvana-inducing pie in Maine or anywhere else, leave a comment below and share the details with the Bakery Boy Blog.